Fat isn’t your body’s public enemy #1 like you were taught it is. Sure, the unhealthy trans fats in processed foods are definitely on the “foods to avoid list.” After all, they cause cardiovascular disease and obesity. But not all fat is out to get you. They might not get the same level of attention as the bad fats, but omega 3 fatty acids work wonders for your entire body. 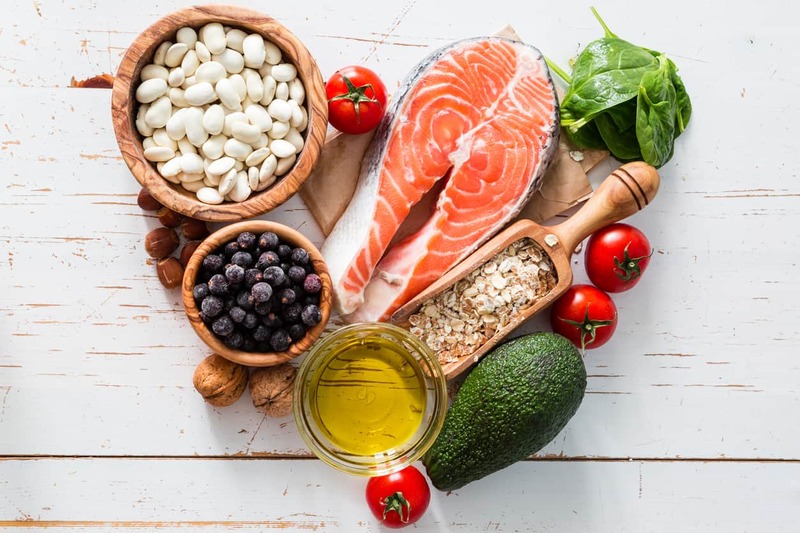 You may have heard that omega 3 fatty acids can help reduce your risk of cardiovascular disease, ease the pain in aching joints, and protect your brain against age-associated cognitive decline and Alzheimer’s disease. Not a bad resume, right? But it gets a whole lot better. Omega 3 fatty acids also play a key role in your bone health and can even help protect you from osteoporosis! So, if you lack omega 3 fatty acids, you’re missing out on a whole host of health benefits. I’ll cover how omega 3 fatty acids can protect you from osteoporosis in just a moment. But first, let’s take a step back and look at essential fatty acids in a slightly broader sense. You need fats to keep functions from your brain to your toes running smoothly. And different functions need different fats. Your body can make some of these fats itself, but not all of them. So you need to give your body a helping hand by providing them via your diet. These are called essential fatty acids. And the omega 3s are one of these essential fatty acids. The Burr’s were initially trying to show that vitamin E is vital for reproduction, by feeding a group of rats a vitamin E-free diet. But the rats in their study were not always sterile. So the Burr’s came to the conclusion that some of the fat in the rats diet must be providing some vitamin E.
After several months without dietary fat, the Burr’s rats developed scaly skin, their tails became inflamed, their paws reddened, and their fur was full of dandruff. The animal’s fur fell out soon after, they lost weight, and eventually, they died. George and Mildred concluded that fat is an essential part of diet for the maintenance of normal physiological function and the prevention of disease… Not just a source of energy as was previously thought. George and Mildred weren’t finished there though! They wanted to unearth exactly what it was about dietary fats that’s so vital. The Burr’s continued their research and published another paper in 1930. They proposed that only one fat could be missing from the diet that the body could not make itself– linoleic acid. The Burr’s described linoleic acid as an essential fatty acid, and the term was born! 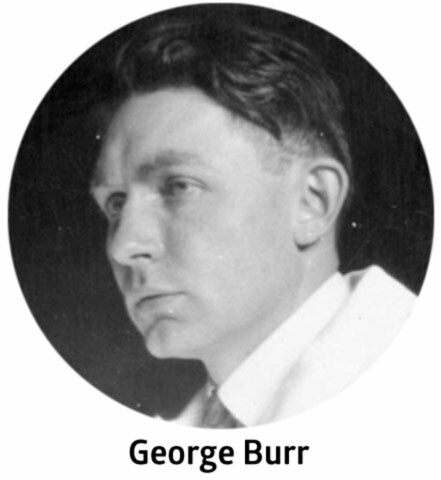 George and Mildred Burr’s discovery was groundbreaking. But their proposal that linoleic acid is the only essential fatty acid was incorrect. In fact, George himself was part of the team that discovered alpha-linolenic acid is also an essential fatty acid. It’s these two omega 3 fatty acids that provide you with the numerous health benefits I outlined at the start of this post. AND, they can help protect you from osteoporosis too. How? Well, EPA and DHA benefit your bones in a few ways. (I’ll go into more detail in the next few sections). But the most notable quality of these two omega 3 fatty acids is that they help protect you from inflammatory diseases. And that includes osteoporosis. EPA and DHA compete for the same enzymes that the omega 6 fatty acids (more on those below) would use to produce pro-inflammatory compounds. EPA and DHA use these enzymes to produce anti-inflammatory compounds– the resolvins and protectins. The aptly named resolvins resolve the inflammatory process. And the protectins protect you from chronic inflammations’ harmful, bone-removing effects. Remember George and Mildred Burr’s first discovery- linoleic acid? Well, we now know that linoleic acid is an omega 6 fatty acid. It’s a “parent” essential fatty acid of arachidonic acid. Now, the omega 6 fatty acids play an important role in your health too, and have protective effects of their own. But get this; if your levels of omega 3s and omega 6s are unbalanced, the omega 6s can actually cause bone loss! See, omega 6 fatty acids, like arachidonic acid, produce inflammatory compounds. The exact opposite of omega 3 fatty acids! So your levels of omega 3 fatty acids and omega 6 fatty acids need to be in balance, or there will be an overload of pro-inflammatory compounds which will cause bone loss. As I mentioned in the last section, anything that causes inflammation activates osteoclasts, the specialized cells that break down your bone. Now, foods containing pro-inflammatory fats (like too much of the omega 6s), environmental toxins, and certain diseases can all cause inflammation in your body. You can check out our “Top Causes of Osteoporosis” page for more information on each of these categories. They all cause inflammatory signals to tell your bone removing osteoclast cells it’s time to get to work. Your osteoclasts are only supposed to remove old and brittle or damaged bone. A job they do very quickly. Then, they’re supposed to clear out and let the bone-building osteoblast cells start the more time-consuming job of rebuilding new bone to replace the bone your osteoclasts have removed. But when inflammation is chronic, your osteoclasts go into overtime. Since building new bone takes much longer than breaking down old bone, too much osteoclast activity can result in bone thinning (or osteopenia) and, ultimately, in osteoporosis. That’s where the omega 3 fatty acids come in. EPA and DHA tune down the inflammatory signalling that causes your osteoclast cells to activate. This effectively sends the osteoclasts home and prevents excessive bone loss. And ultimately osteoporosis! 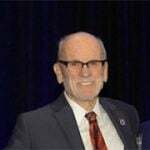 What’s more, EPA and DHA increase the production of the bone-building osteoblast cells, invite them in and give them enough time to lay down new bone. It all sounds quite straightforward, but in reality, the process is very complex. We now know that an intricate dance is constantly occurring within our bodies that enables inflammatory signals to be sent when needed and shut down when further inflammation could cause harm. Both types of essential fatty acids – the omega 3s and the omega 6s – are partners in this inflammation-regulating dance. When they move together in balance, damaged bone is removed while new bone is continuously built. But when omega 3 isn’t available to partner omega 6 in this dance, the inflammatory side of omega 6 spins out of control. Osteoclasts go on overtime. Osteoblast production and activity is inhibited, and you lose bone. In your bone marrow, you have cells called mesenchymal stem cells (MSCs.) MSCs can become osteoblasts, or they can become adipocytes, which are fat cells. Obviously, you’d prefer healthy bones to unhealthy amounts of fat. But what makes your MSCs become osteoblasts or adipocytes? That’s where the omega 3s and omega 6s come in. MSCs are influenced by the compounds derived from both omega 6 (linoleic acid [LA]) and the omega 3 (alpha-linolenic acid [ALA]) fatty acids. Remember, LA (omega 6) and ALA (omega 3) are the “parent” compounds all the essential fatty acid “children” are derived from. The “offspring” of LA convince MSCs to become fat cells, while those of ALA convince them to become osteoblasts. OPG looks just like another, but very pro-inflammatory, compound called RANK (receptor activator of nuclear factor-kappa B). For RANK to become active, it has to be turned on by another compound called RANKL, which stands for the RANK ligand. When RANKL binds to RANK, this sets off a whole series of inflammatory events that results in the production of osteoclasts ready to remove bone. But the good news is that when RANKL binds to OPG instead of RANK, no inflammatory signals get sent, and no osteoclasts get produced. It’s important to note here though, that you do want to have some RANKL to RANK binding. You need osteoclasts to remove old brittle bone, so there’s room for new, healthy bone to be laid down to replace it. And, RANKL’s binding to RANK is also necessary for the activation of immune cells (your T and B cells, specifically). You must have functional immune systems to survive after all. What good are great bones if you’re easy prey for destruction by infections or cancer? Again, the key here is BALANCE. The nifty way our body has worked out this balancing act among RANKL, RANK, and OPG is just one example. 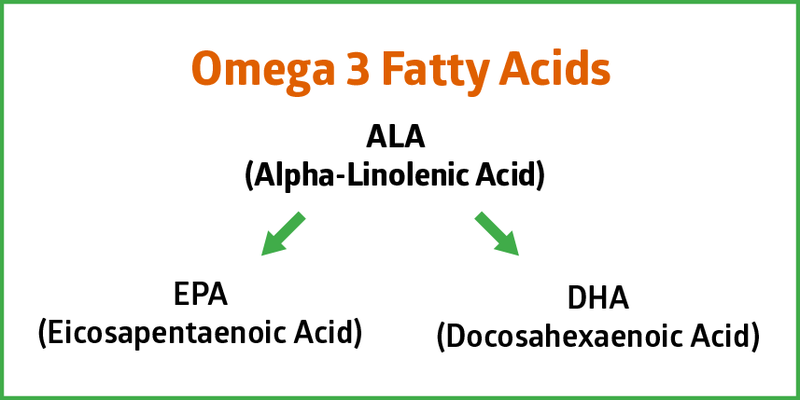 In contrast to the parent omega-6, linoleic acid, and its offspring, (AA), the parent omega 3, alpha-linolenic acid, and its offspring, EPA and DHA, combat inflammation. The omega 3s inhibit the production of osteoclasts, and this slows the rate of bone removal. Plus, the omega 3s encourage MSCs to become osteoblasts, increasing the number of the cells that build new bone, and reducing the amount of fat cells. It’s a win-win! One of the most recent studies on the relationship between omega 3 fatty acids and bone health involved 117 healthy, postmenopausal women. The intervention group – The women in this group consumed 0.5 liters a day of a low-lactose skimmed milk enriched with 40 mg (100 ml) of EPA and DHA and 0.54 g (100 ml) oleic acid– an omega 9 fatty acid. The control group – The women in this group consumed 0.5 liters a day of a semi-skimmed milk enriched with just vitamins A and D.
After 12 months, the intervention group saw a 5.78% decrease in total cholesterol, while the control group saw no change. The intervention group saw a 28.20% decrease in C-reactive protein (a marker for inflammation), and a 17.64% decrease in RANKL– remember, when RANKL binds to RANK, it sets off a chain of inflammatory processes which results in more osteoclast activity and bone loss! Another recent study focused on the relationship between omega 3 fatty acids and bone density in 1,865 Spanish women aged 20 to 79. Each woman underwent a dual-energy X-ray absorptiometry (DEXA) to measure their bone mineral density (BMD). One hundred and ninety four women had osteoporosis, 707 had osteopenia, and 964 had a normal bone density. 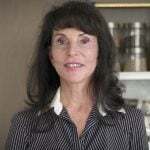 In addition, each woman recorded her dietary intake of calcium, vitamin D, the omega 3s (ALA, EPA, and DHA) and the omega 6s (LA and arachidonic acid) in a food journal. The study found that women with a normal bone density consumed more EPA and DHA combined than the women who had osteopenia or osteoporosis. Plus, the women who had osteopenia consumed more EPA and DHA combined than the women who had osteoporosis. 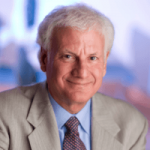 Now, the researchers couldn’t pinpoint EPA and DHA intake as “significantly correlated” with BMD in the women with osteoporosis. Their calcium and vitamin D intake, their age, and their menopausal status (post-menopausal women lose much more bone each year than premenopausal women) all are variables that could contribute to their low BMD. Still, the fact that the women with osteoporosis generally consumed less EPA and DHA is telling. 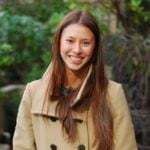 But, the researchers did conclude that omega 3 fatty acid intake was “significantly associated” with BMD at both the hip and the lumbar spine in women with a normal bone density and women with osteopenia. Are You Getting Enough Omega 3s? There’s currently no universal recommendation for the daily intake of EPA and DHA. But current research shows you gain the optimal health benefits of omega 3 fatty acids when you consume 2.6 to 3 grams combined of EPA and DHA a day. And remember, optimal bone health requires a balance of omega 6s and omega 3s. You want to make sure your ratio of omega 6 to omega 3 intake is no more than 4:1. Ideally, the ratio would be more like 2:1! So keep your intake of omega 6s (think processed vegetable oils like corn, canola, and soy) in check. Mercury Rising: Unfortunately, many fish now contain high levels of mercury. (Industrial activity creates airborne mercury which finds its way into lakes, rivers, and oceans and is eventually eaten by fish). And when you consume the fish, you consume the mercury too. And that’s bad news for your bones! Mercury builds up in your kidneys’ and damages them. This impairs your kidneys’ ability to convert vitamin D into its active form, which is the form of vitamin D that helps you absorb calcium. The fish listed in the table above all contain a low enough mercury level to be considered safe for regular consumption. But other high sources of EPA and DHA, like bigeye and ahi tuna and king mackerel, contain dangerous amounts of mercury if you consume them regularly. Check out this handy resource from the Natural Resources Defense Council for more information on the fish you should try to avoid. That’s why omega 3 supplements, like Triple Power Omega 3 Fish Oil, are a more convenient, realistic way to meet your daily needs. Triple Power Omega 3 Fish Oil provides 1200 mg of EPA and DHA combined in every tablespoon. 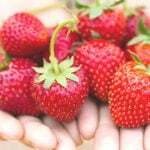 (There are 1000 milligrams in a gram, so a couple tablespoons of Triple Power a day and you’ll be well on your way to that optimal recommended intake of 2.6 to 3 grams). And remember the high level of mercury in many fish I mentioned earlier? Well, Triple Power only uses fresh, wild anchovies, sardines, and mackerel from small, local fisheries in the Pacific. These fish already contain a very low level of contaminants like mercury. But to be on the safe side, Triple Power is molecularly distilled to produce a pure, ultra-refined oil with virtually no contaminants. It’s a safe, effective way to get your omega 3s. 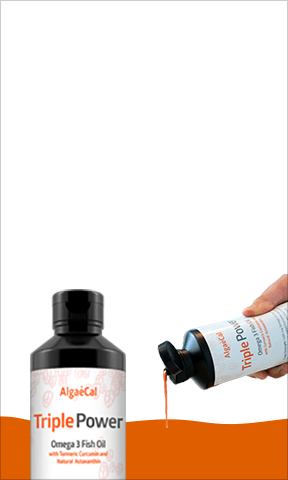 What’s more, Triple Power provides a further 280 mg of other omega 3 fatty acids. 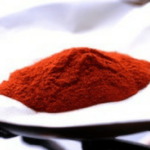 Plus astaxanthin and curcumin; two of the most powerful anti-inflammatories on the planet! Remember, chronic inflammation activates your bone-resorbing osteoclast cells. Triple Power is a liquid emulsion too. That means the anti-inflammatory curcumin and astaxanthin are better absorbed. And, it can be flavored. Triple Power’s mango flavor is truly delicious. No nasty fishy burps with Triple Power! I actually like to drizzle my Triple Power over my morning granola, but I’m always on the lookout for new uses, so please let me know how you use yours in the comments section. 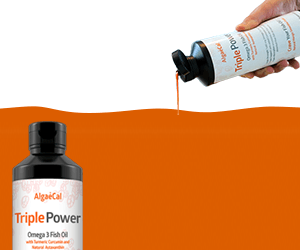 The Tastiest Way To Get Your Omega 3s1200 mg of EPA/DHA per tablespoon!Get Triple Power Now! Alpha-linolenic acid (ALA) is an important omega 3 fatty acid in its own right. But it’s not a suitable substitution for EPA and DHA. It just won’t provide you with the same bone-protecting benefits. Many people think these plant-based omega 3 sources will fulfill their EPA and DHA needs because they contain ALA, and ALA can be converted to EPA and DHA. 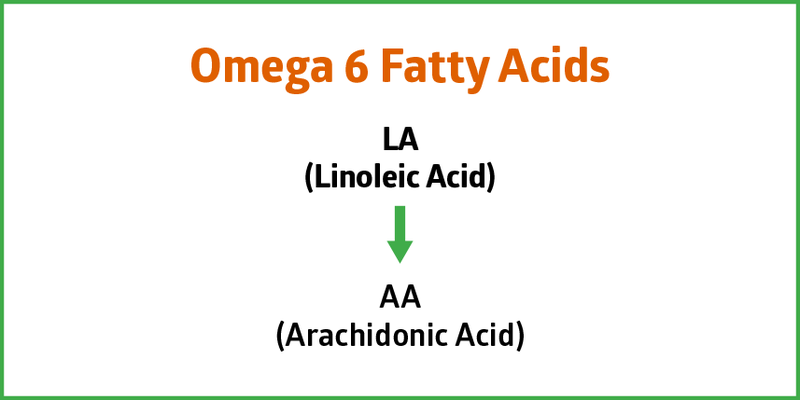 While it’s true your body uses alpha-linolenic acid to produce EPA and DHA, you only convert a very small amount. In fact, studies show humans who eat a diet high in saturated fat convert as little as 6% of dietary ALA to EPA. And just 3.8% of ALA is converted to DHA. A diet high in omega-6 rich vegetable oils inhibits ALA’s conversion to EPA and DHA further. Research shows the conversion of ALA to EPA and DHA is reduced by 40% to 50% in such diets! The bottom line: You should include plant-based omega 3 sources in your diet. But you need to make sure you include EPA and DHA specific sources (like seafood and Triple Power Omega 3 Fish Oil) too. You may have heard of other health benefits of omega 3 fatty acids before. They reduce your risk of cardiovascular disease, ease the pain in aching joints, and protect your brain from age-related diseases. But now you know omega 3s play an important role in your bone health too! EPA and DHA are the two omega 3s that provide the most benefit to your health and bones. Oily fish like mackerel and anchovies provide the most EPA and DHA. But to reach the optimal recommended daily intake of 2.6 to 3 grams you’d have to eat a lot of fish! That’s why a fish oil supplement like Triple Power Omega 3 Fish Oil is the most convenient, realistic way to reach your daily target. 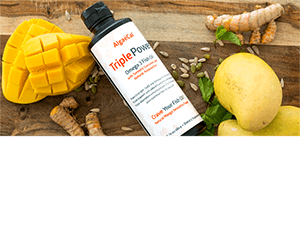 Triple Power contains a combined 1200 mg of EPA and DHA. And it tastes absolutely delightful! I am 93 and have osteoporosis. What are your thoughts? I try to walk or do a mile on the treadmill and eat healthy ,IMO. I am fortunate that I do not have any obvious effects and walk with a straight back and keep my head in alignment.Any suggestions? We’re so glad you reached out, Dolly. It’s wonderful to hear you’re staying active and eating well! 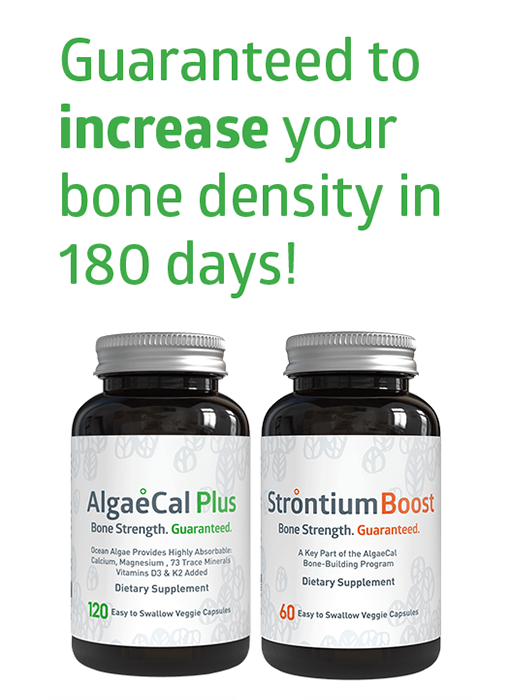 It’s truly never too late to reclaim your bone health safely and naturally with AlgaeCal — no matter your age or severity of bone loss. We would love to share with you Mildred’s story, she is 88 years and has experienced incredible results. You can hear her story and see her DEXA scan results here. Can you tell me how hemp seeds and hemp seed oil compare for the provision of omega 3? I’m vegetarian and am hoping this is a good alternative to fish oil. 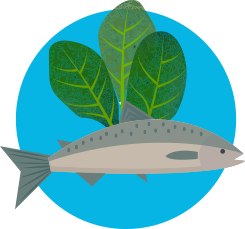 Near the bottom of this post we cover ‘Animal vs Plant-Based Omega 3s’. Hemp seeds or hemp seed oil fit into the plant-based category and aren’t going to provide you with the same bone-protecting benefits as fish oil. You can learn more about why this is in the article. You can still take hemp seeds for some benefit! Plus you can increase your omega 3 intake through other sources like brussel sprouts, chia seeds, and flaxseed. I would like to see more support from you in favor of Algae Based DHA & EPA. I take Algae Omega instead of Fish Oil. Two tablets supply 715 mg of Total Omega 3’s. I take four tablets daily. Thank you for your feedback and we definitely understand where you’re coming from! We are simply trying to inform our readers of the latest and most up-to-date research so they can make an informed decision about their health. To get the optimal health benefits of omega 3 fatty acids you need to consume 2.6 to 3 grams (2,600 to 3,000 mg) of combined EPA & DHA a day. The top sources of EPA and DHA are predominantly seafoods, especially oily fish — this is why we’re big supporters of fish oil! I am Vegan. What are your suggestions for other Vegans and me? Flax seed oil, coconut oil? Other options include chia seeds, hemp seeds, and walnuts! I’ve also tried this omega-3 plant supplement and thought it was quite good — it had a nice flavor and I like that it comes in a liquid form. I have the the omega 3 blood level test kit i got with a triple power purchase a couple of years ago. Can i still use it? Yes, the kit itself is good for 2 years after purchase! I have osteoporosis and take the algaecal and strontium. It’s been 2 months since starting. Should I be taking 2 T a day of the omega 3 oil or is one enough? Good question, Gloria! It’s totally up to you — but we usually recommend taking 2 tbsp/day for the first three months to target inflammation head on and increase your omega 3 levels. Then continuing with 1 tbsp/day after that initial period. Is this available without the added astaxanthin and curcumin? These can be contraindicated for some people with other health conditions. I have been taking Algae Cal for 1 1/2 yrs now. I am interested in your new Omega 3 supplement with antioxidants. Would I get the same or comparable bone benefits from it? Yes, Triple Power Fish Oil is another key supplement to combating osteoporosis and would be a great addition to AlgaeCal Plus for your bone health. As stated by Lara in this article, omega 3s defend our bones from osteoporosis by lessening inflammation in the body. And we now know that inflammation is a major contributing cause of osteoporosis. 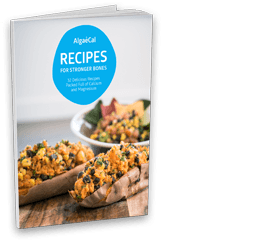 AlgaeCal’s Triple Power Omega 3 Fish Oil can combat this inflammation because it has high doses of omega 3s, plus the two most potent antioxidants on the planet: turmeric curcumin and astaxanthin. 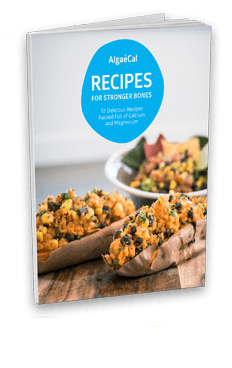 This synergistic combination is not only healthful for your bones, but for your overall health. 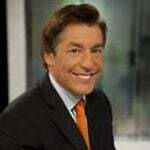 This is a great article. I didn’t know that omega 3 fatty acids are beneficial for building and protecting bones. It’s also nice to understand how they do this, and I’ll enjoy remembering this info as I consume my daily omega 3’s!